Last year in June, I made a 4-day solo trip to Penang. Since it was a solo trip, I decided not to drive. I was undecided whether to fly there or take a bus. In the end, I decided to take the Aeroline bus to Penang. A month before the trip, I had booked and bought a return ticket via their website www.aeroline.com.my. It's a pretty user-friendly website and you can even select the seats that you like. However, you would need to go to the Aeroline service centre to print out the boarding ticket. All you need to do is to present your PIN number and your ticket will be printed out. There is no need to print out your confirmation email, so please save paper! The above is my boarding ticket for the journey from One Utama Bus Terminal in Petaling Jaya to the Sungai Nibong Bus Terminal in Penang. The price is RM60. Notice I chose Seat 8A which is somewhere in the middle because I do not like to sit too front or too back. LOL! For the return journey, another boarding ticket is issued. If you are one who easily lose stuffs while traveling, it is better to print the return journey's ticket just before you board the return bus home. This is because if you lose the ticket, you will have to buy a new one! Note that they only accept the boarding ticket for you to get onto the bus. Any other documents or proof of purchase are not considered valid, so make sure you are there at least half an hour before the bus departs to get your ticket printed. This is the Aeroline service centre at the One Utama Bus Terminal. After having my ticket printed, I proceeded to the waiting area. I was pleased to find that it was rather spacious! There were seats for you sit and shelves for you to put your luggage. They also provide free wifi so you can go online using your smartphone or laptop while waiting. If you are thirsty, you can also make your own coffee or tea. There are electrical sockets for you to charge your phones or laptops too. Not bad, eh? Since I was early, I left my luggage at the waiting area and went into One Utama shopping mall and had my breakfast at Subway and shopped a little bit at Cold Storage to kill some time. It is safe to leave your luggage there but make sure it is locked and does not contain important documents, which you should carry with you at all times. When I returned to the waiting area, the staff told me that the bus had been delayed. Oh no!! Luckily, I did not have to wait for long as the bus finally arrived at 10.50am - about 20 minutes late. By 11am, the bus left the One Utama bus station and started the journey to Penang. The Aeroline bus is actually a double decker bus. The passenger seats are all at the top deck. The lower deck consists of a business lounge and a wash room. Note that the wash room is meant for light usage only, so please do not do your big business there! By the way, the above picture was not taken at the One Utama bus station, but at a rest stop along the way to Penang. This is how the interior of the bus looks like. There is touch screen entertainment system offering a wide selection of movies, music and games to keep you entertained throughout the journey. Head phones are given to each passenger for the duration of the journey. I liked that they have a cushion to support my back. Nice! Blanket is also provided if you request for it. The seat also has a nice feature that provides good head and neck support, which is important for long journeys. There is also a power socket available at every seat for you to charge your hand phones. Excellent! The only problem is the power socket is located at the bottom near the feet area and it could get quite dirty. Maybe they should clean it periodically. Seat belt is provided to ensure safety of passengers. The air conditioning vents and reading lights above each seat. I felt it was way more comfortable than flying AirAsia. No wonder the Aeroline's slogan is "The Convenient Way To Fly". LOL! During the 20-minute stop, I had the chance to take photos of the driver's seat and also the business lounge at the lower deck. The lounge can accommodate up to 6 people and is especially useful for a group meeting or discussion. Food and beverage (you can choose either coffee, tea or Milo) are provided. Every passenger is also given a bottle of mineral water. These are all included in the ticket price. During my journey, I was given a simple meal of chicken rice. Quite delicious actually. Maybe I was hungry! The journey from Petaling Jaya to Penang was estimated to be about 5 hours long. The bus reached there ahead of time, at 3.40pm - about 4 hours and 40 minutes. The bus makes two stops in Penang - the first one at Queensbay Mall and the final stop at Sungai Nibong Bus Terminal. 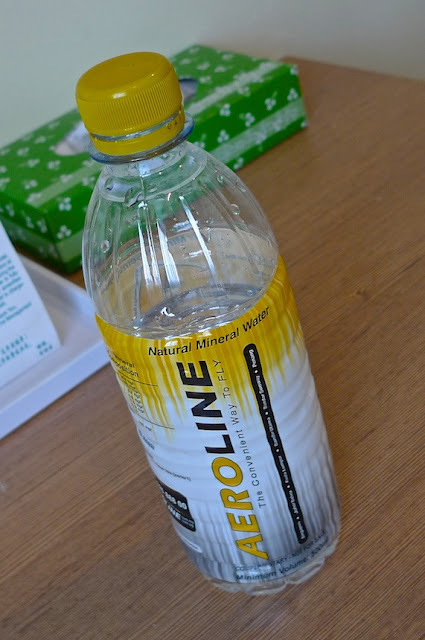 I alighted at the Aeroline service centre at Queensbay Mall Penang. Those who do not wish to alight at Queensbay Mall can drop off at the Sungai Nibong Bus Terminal. For the return journey back to Petaling Jaya, the bus picks up passengers at Sungai Nibong Bus Terminal first before going to Queensbay Mall. I enjoyed traveling with Aeroline and had no regrets choosing it for my trip to Penang and back. The cabin crew were friendly and hospitable and were dressed smartly, comparable to stewards and stewardesses in airplanes. The one thing I think is missing is free wifi. 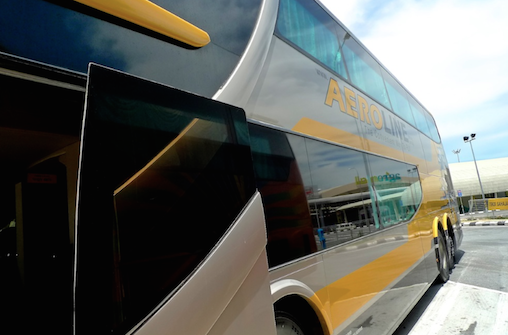 If Aeroline can provide free wifi onboard the bus, that would really make my day!